Looking for a lakeside getaway in the Great Smoky Mountains? 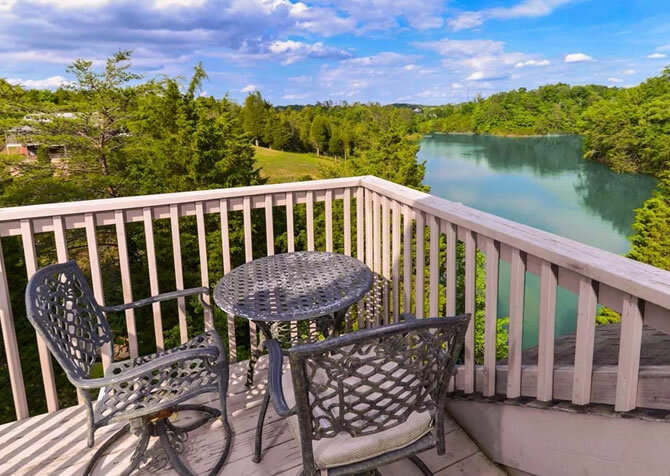 Look no further than Boone Docks, your next vacation destination — featuring 3 bedrooms, 2.5 bathrooms, and bonus amenities on Douglas Lake near Pigeon Forge — only 20 minutes away from local attractions, shopping outlets, and gourmet restaurants. Accommodating up to 8 guests, this semi-private cabin rental harbors a fully equipped kitchen for preparing family meals, a rec room with a flatscreen TV for entertainment, an outdoor breakfast table to unwind with a tranquil view each day, and a private dock for swimming, fishing, and dipping your toes at the beautiful lake in summer! From fun family trips to getaways with friends, Boone Docks won’t disappoint — with plenty of space and a lakefront location! Relax in comfort in the bright living room just off the front door, boasting a mounted flatscreen TV, DVD player, plush sofa, and a wingback chair. Set up the space for movie night with buttered popcorn, chocolate treats, and soda pop on the coffee table, create pillow pallets on the carpeted floor for the kids, and pop in a family feature film. Once the little ones are all tuckered out, pull out the sleeper sofa for a bedtime story and a sweet lullaby. And take it easy in the evenings with a toasty fire in the gas fireplace and a good book or trendy magazine — you deserve some down time! Plan on cooking a few meals while on your vacation? Not a problem! In fact, you’ll enjoy the kitchen that Boone Docks offers. Spacious with black-and-white appliances and 2 barstools that overlook the space, the kitchen is ideal for preparing one of your famous dishes. Grab fresh ingredients from the fridge, whip up recipes on the stove, and sit the kids at the breakfast bar to help prepare the evening’s dessert. When the messes are made, take a step back and let the handy dishwasher take care of the dirty work for you! Just off the kitchen lies the dining area with a large table for 6, great for serving up bountiful breakfasts, tasty lunches, endless snacks, and delectable dinners. Plus, it’s right next to the kitchen bar, so keeping everyone connected at mealtime will be a piece of cake…or pie. After the food settles, bust out a pot of coffee to pair with dessert or clear the space for a board game tournament, a few rounds of cards, or coloring time with the kids. At the end of the day, it’s always nice to have a place to call home, especially when on vacation. With 2 queen bedrooms on the entry level and a king master suite on the second floor, Boone Docks provides not only a place to rest your head for the night but also a space to get some much-needed privacy. Flip on the TV before hitting the hay on a queen-size bed and sleep in until noon — this is your vacation after all! Better yet, head upstairs for a spa bath in the master suite’s jetted tub before snuggling with your spouse on the king-size bed and watching a romantic comedy with the DVD player. The great outdoors is why you’re here, so leave your bags in the cars at the paved parking area (motorcycle friendly) for 3, walk 4 steps into the cabin, and head straight for the private dock out back for an incredible view of Douglas Lake! Soak in the tranquil vibes and let your relaxing Smoky Mountain vacation begin. When you can’t bear to part ways with the water, unwind in the nearby covered gazebo, complete with ample bench seating. In fact, this is the perfect spot to bring hamburgers and hot dogs fresh off the charcoal grill for a barbecue feast with the family. It’s also a great location to count your fishing haul — fingers crossed you reel in a whopper! As evening approaches, enjoy the peaceful lake views with a glass of champagne from the patio furniture on the entry-level deck. In the mornings, sip hot coffee or tea from the master suite’s private deck overlooking the lake and surrounding nature. Note: while the lake does drop seasonally (highest between early June and Labor Day), Boone Docks always offers a lakefront location! Offering more than tranquil lake views and cozy accommodations, Boone Docks also boasts a washer and dryer to launder clothes and towels with ease throughout your stay and a VCR to bring back childhood memories. Perhaps the best amenity of all is that this cabin is pet friendly, so you can bring your furry friend on vacation! Splash in the water together, play fetch all day, and end every night with a special treat from town. Located only 20 minutes from downtown Pigeon Forge, Boone Docks is well worth the drive if you prefer a lake location. Plus, you’re never more than a short trip away from some of the area’s best shopping, dining, and entertainment locations. Take the whole family for a 6-mile horseback ride with breathtaking Smoky Mountain views all around at Five Oaks Riding Stables! Soar up to 50 miles per hour over 7 ziplines at Adventure Parks Ziplines, boasting a professionally trained staff to keep your mind at ease while you zip through the trees. Tour the halls, cabins, and parlors of the Titanic and gaze at over 400 genuine artifacts from the ship at the Titanic Museum Attraction.